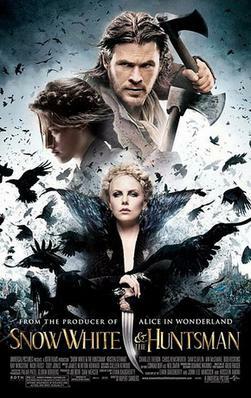 I haven't been as much of a movie-goer as I used to be (though I did go see The Avengers), but I really liked Snow White and the Huntsman. I don't like Disney's Snow White movie, despite choosing to dress as the princess for my half marathon. She's a weakling, a sing-songy damsel in distress. This isn't that Snow White. I really liked how they wove the Grimm Brothers story into the film, but also how they made Snow White into a badass princess. There is magic, there are dwarves, and there's a poisoned apple. But she's not going to give up; she's a survivor. And even though there are people coming to her rescue, this Snow White only wants them as backup. She knows it's her destiny, and she can put on armor and fight like the rest. I didn't feel like this was the best movie of the summer. But I was really entertained, and the film was just so excellently executed. The detail in the cinematography was stunning, and the battles scenes were convincing. I had fun, and that's what matters to me when I choose to see a movie in the theaters vs. on Netflix DVD. On another note, has anyone else ever gone to see a movie on their own? It's something I've been comfortable doing since I was a teenager; I even used to go see Broadway shows by myself in college. While I do like having people to go with, a lack thereof never stop me from seeing doing I wanted to do. But I've met people who say they're afraid to go alone! If that's you, just do it. There's nothing to fear. P.S. Did anyone else notice that Snow White's dress the in the beginning kind of resembled her Disney-fied dress? The sleeves!